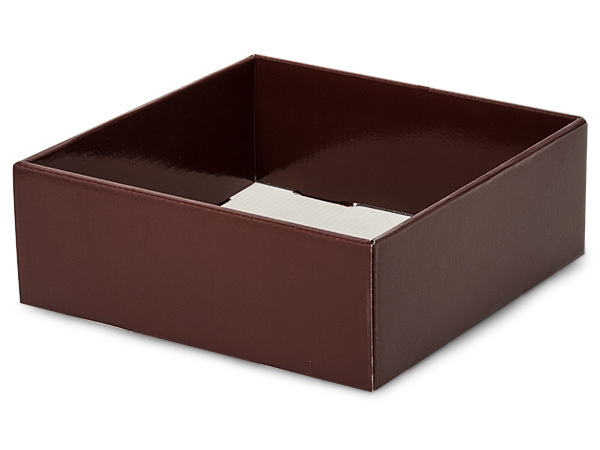 8 x 8 x 3" 10 x 10 x 3" 12 x 9 x 3"
These small square cardboard trays have a chocolate brown gloss finish. They measure 8x8x3" when fully assembled. Gift baskets are easy to put together and display in these shallow containers. When paired with shreds, they are perfect for tall displays or for holding your gourmet meat and cheese trays. These square and rectangular gift basket market trays have a 1-piece construction with an open top. They store flat and are quick to assemble. Made from E-flute corrugated board- these containers will be a sturdy base to any gourmet food gift set or gift basket!